Bias and uncertainty in Hg flux measured by micrometeorological methods (MM) and dynamic flux chambers (DFCs) are assessed from two field inter-comparison campaigns. DFC flux bias follows a diurnal cycle due to modified temperature and radiation balance inside the chamber. The precision in concentration difference measurements poses critical constraint on obtaining a larger fraction of significant MM flux. Asynchronous sampling impairs flux accuracy under varying atmospheric Hg concentration. Sudden stratospheric warmings (SSWs) cause a rapid rise in lower stratospheric temperatures, terminating conditions favorable to chemical ozone loss. We show that although temperatures rose precipitously during the vortex split SSW in early Jan 2013, because the offspring vortices each remained isolated and in regions that received sunlight, chemical ozone loss continued for over 1 month after the SSW. Dec/Jan Arctic ozone loss was larger than any previously observed during that period. This paper investigates 3-D mountain effects on solar flux distributions and their impact on surface hydrology over the western United States, specifically the Rocky Mountains and the Sierra Nevada, using the global CCSM4 (CAM4/CLM4) with a 0.23°×0.31° resolution for simulations over 6 years. We show that deviations in the net surface fluxes are not only affected by 3-D mountains but also influenced by feedbacks of cloud and snow in association with the long-term simulations. In this study we summarize 1 year of Raman lidar observations over South Africa. The analyses of lidar measurements presented here could assist in bridging existing gaps in the knowledge of vertical distribution of aerosols above South Africa, since limited long-term data of this type are available for this region. For the first time, we have been able to cover the full seasonal cycle on geometrical characteristics and optical properties of free tropospheric aerosol layers in the region. A new methodology was developed for retrieving the daily direct radiative forcing of smoke aerosols (24h-DARF) using satellite remote sensing. This method was used to assess the DARF at high temporal resolution and over a large area in Amazonia. We showed that our methodology considerably reduces statistical sources of uncertainties in the estimate of the DARF. DARF assessments using the new methodology agree well with ground-based measurements and radiative transfer models. The exchange of energy between the Earth surface and the atmosphere is governed by turbulent processes which form the convective boundary layer (CBL) in daytime. The representation of the CBL in atmospheric models is critical, e.g., for the simulation of clouds and precipitation. We show that a new active remote-sensing technique, rotational Raman lidar, characterizes the turbulent temperature fluctuations in the CBL better than previous techniques and discuss the statistics of a typical case. Thanks to numerical simulations and satellite observations, it is shown that aerosol optical depth (AOD) trends (2000--2010 period) over the US and Europe are due to emission decrease, while over the Sahara Desert and the Middle East they are due to meteorological changes. Over Southeast Asia, both meteorology and emission changes are important for the AOD trends. It is shown that soluble components strongly influence AOD, as their contribution is enhanced by the aerosol water content. Regional NO2 distributions can be simulated by models or retrieved from satellite observations. We developed a custom OMI NO2 data product for the Pearl River delta region which reduces biases compared to the standard product. The product is used for the evaluation of a regional air quality model for which it is a useful addition to ground measurements. The unbiased NO2 data product can be very helpful for air pollution studies in urban areas. To study the effect of giant cloud condensation nuclei (GCCN) on precipitation processes in stratocumulus clouds, 1-10 µm diameter salt particles were released from an aircraft while flying near the cloud top off the central coast of California. The analyses suggest that GCCN result in a four-fold increase in the cloud base rainfall rate and depletion of the cloud water due to rainout. The present study uses aerosol optical depth as proxy to estimate 12 years of PM2.5 data for the Beijing central area and calculate the yearly premature mortality by different diseases attributable to PM2.5. The estimated average total mortality due to PM2.5 is about 5100 individuals/year for the period 2001--2012 in the Beijing central area, and the per capita mortality for all ages due to PM2.5 is around 15 per 10,000 person-years for the period 2010--2012. Extraction of natural gas and oil is associated with a range of possible atmospheric environmental issues. Here we present an analysis of gas-phase hydrocarbon measurements taken in an oil and natural gas extraction area in Utah during a period of high wintertime ozone. We are able to constrain important chemical parameters related to emission sources and rates, hydrocarbon photochemistry, and VOC composition. MERRAero is an aerosol reanalysis based on the GEOS-5 earth system model that incorporates an online aerosol module and assimilation of AOD from MODIS sensors. This study assesses the quality of MERRAero absorption using independent OMI observations. In addition to comparisons to OMI absorption AOD, we have developed a radiative transfer interface to simulate the UV aerosol index from assimilated aerosol fields at OMI footprint. Also, we fully diagnose the model using MISR, AERONET and CALIPSO. In this paper, it is found that the diurnal variations of single scattering albedo (SSA) and asymmetry factor (g) for ambient aerosol are both evident and far different from those of dry state aerosol in the North China Plain (NCP. The diurnal changes of SSA and g have significant impacts on the estimation of daily average direct aerosol radiative effect (DARE) at the top of the atmosphere. In addition, several suggestions are proposed to improve the accurate prediction of DARE in the NCP. (1) Four different parameterizations for the formation and chemical evolution of secondary organic aerosol (SOA) are evaluated using a box model representing the Los Angeles region during the CalNex campaign. (2) The SOA formed only from the oxidation of VOCs is insufficient to explain the observed SOA concentrations. (3) The amount of SOA mass formed from diesel vehicle emissions is estimated to be 16-27%. (4) Modeled SOA depends strongly on the P-S/IVOC volatility distribution. Strong solar heating by absorbing aerosols (black carbon) is considered more effective in inducing atmospheric circulation change than reflecting aerosols (sulfate), which do not have direct atmospheric heating effect. Surprisingly, we show that reflecting aerosols induce tropospheric temperature and circulation response similar to that induced by absorbing aerosols. The common response is mediated by the ocean through SST gradient, a process overlooked so far in aerosol-climate connection. While direct wind observations are routinely made in the troposphere (0-10km), in the stratosphere (above 10km) wind observations are sparse. This study examines the potential of using ozone observations to infer stratospheric wind. This novel approach is tested with a data assimilation system based on a simplified model of the atmosphere, the so-called "shallow water model". It is shown that assimilation of ozone observations significantly benefits winds, particularly in the tropics. We have examined the effects of ozone precursor emissions and climate change on the tropospheric ozone budget. Under RCP 6.0, ozone in the future is governed primarily by changes in nitrogen oxides (NOx). Methane is also important, and induces an increase in tropospheric ozone that is approximately one-third of that caused by NOx. This study highlights the critical role that emission policies globally have to play in determining tropospheric ozone evolution through the 21st century. 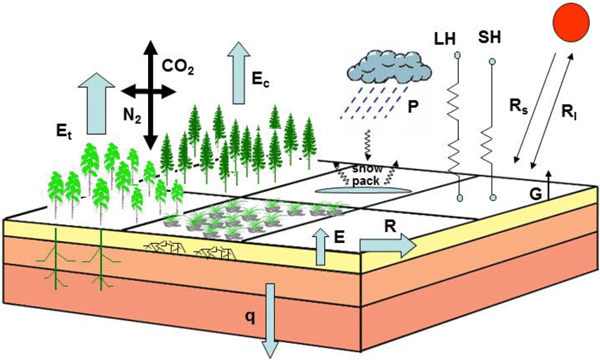 Land surface models (LSMs) describe how carbon and water fluxes react to environmental change. They are key component of climate models, yet they differ enormously. Many perform poorly, despite having many parameters. We outline a development strategy emphasizing robustness, reliability and realism, none of which is guaranteed by complexity alone. We propose multiple constraints, benchmarking and data assimilation, and representing unresolved processes stochastically, as tools in this endeavour.